Alain Ducasse, the renowned French chef boasting 19 Michelin stars under his toque blanche, inaugurated Brasserie Champeaux in April 2016, with his business partner, Olivier Mauray. Located under La Canopée at the over 800 year old, Forum des Halles, in Paris' 1st arrondissement, this is the first brasserie for Chef Ducasse, who also owns many bistrots and restaurants worldwide. 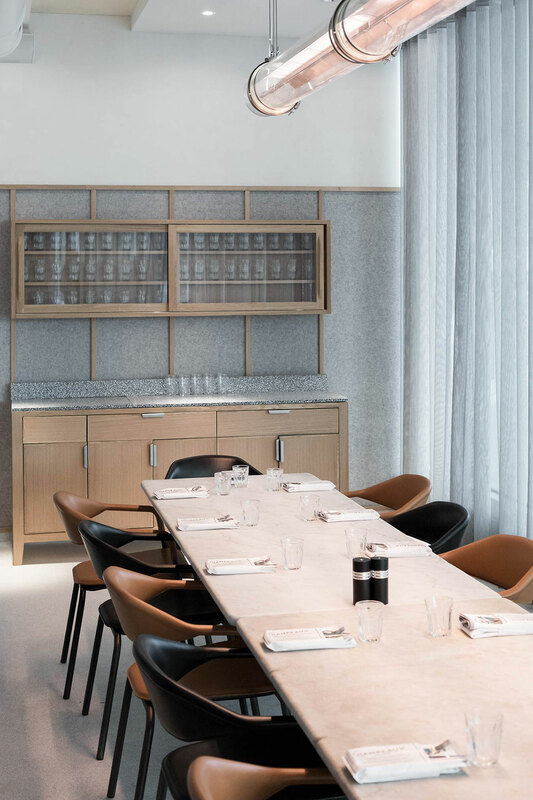 Inspired by a vintage menu dating back to December 1900, from a restaurant called Champeaux, Chef Ducasse envisioned the quintessential French brasserie: a spacious, welcoming space where people could enjoy delicious, seasonal and informal meals throughout the day. Even with its 1900 inspiration, interestingly Brasserie Champeaux is low on nostalgia but rather high on 21st century sensibilities. 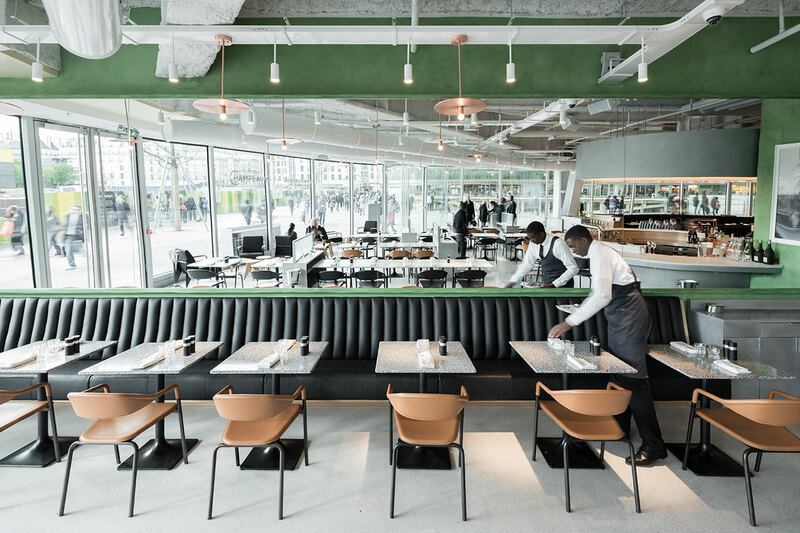 Paris-based design studio, ciguë, translated Ducasse’s vision on the corner of the sunny terrace opposite des Halles' Saint-Eustache church, overlooking the Nelson Mandela Gardens into a space where patrons are visually treated to an array of interacting décor elements which purposefully and collectively create a modern and familiar vibe from the moment one enters the brasserie's wide glass doors. 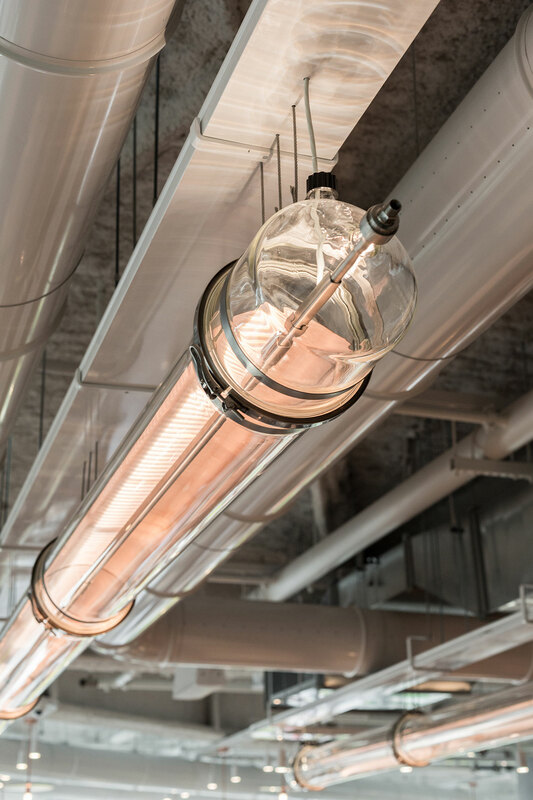 An impressive troop of custom made tubular, glass and copper light fixtures hang from the ceiling throughout, appearing to mimic the large industrial pipes beside them. 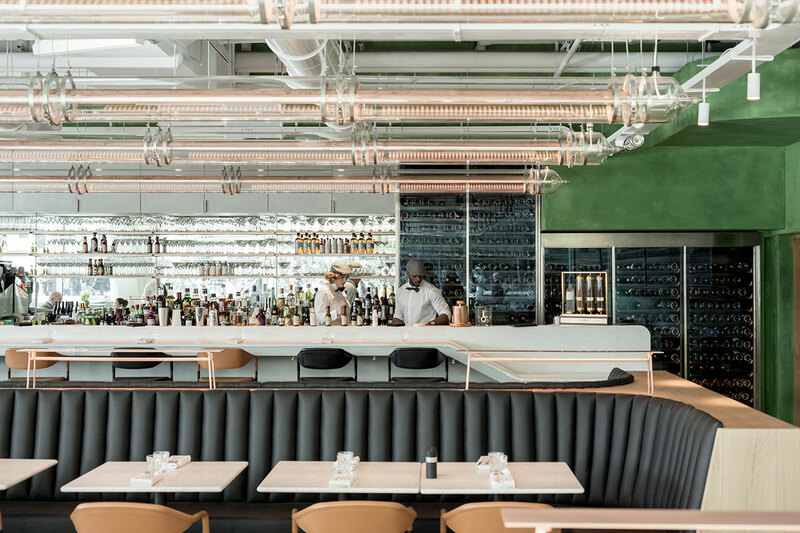 A bar, ingeniously constructed of aluminum, terrazzo and stainless steel takes center stage and is systematically surrounded by tables and dining alcoves accommodating up to 180 diners. The pale color scheme -the light, sage green on the painted plaster walls provides the greatest color "pop" -imparts a sense of calm, featuring white terrazzo floors, white painted industrial elements (such as the large pipes and cement beams) of the ceiling, beige leather saddle stitched seating, as well as light-wood cabinetry and terrazzo-topped iron tables. 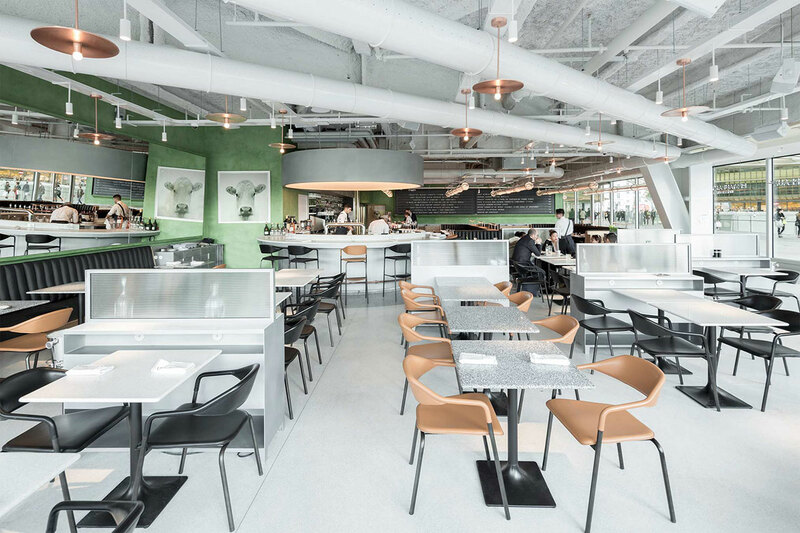 An impressive troop of custom made tubular, glass and copper light fixtures hang from the ceiling throughout -appearing to mimic the large industrial pipes beside them- their incandescence doubling in their reflections on the mirrored walls. 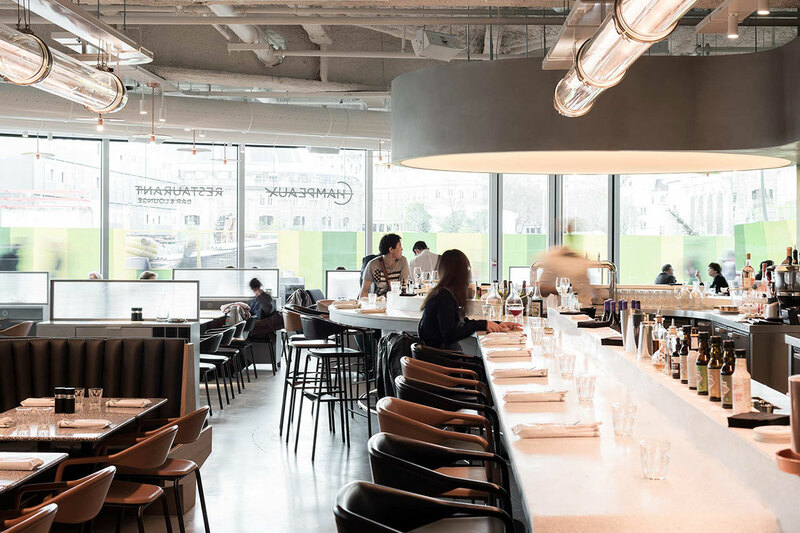 The far wall boasts an oversized display board (8.6 m long x 1.4 m wide) reminiscent of the scrolls used in airports and railway stations, displaying a revolving menu and an "interactive connection to the kitchen." As the board is updated with new menu information such as the signature soufflés created by resident chef, Bruno Brangea, or a list of wines-of-the-day selected by head sommelier, Gérard Margeon, it seems to play off the constant movement happening outside the large glass windows, as passersby walk up and down the Canopée. Not to be missed is Brasserie Champeaux's le salon prive, an intimate dining area perfect for celebrations or business meals of up to fourteen guests, overlooking the main square of the Canopée. The two tables which Chef Ducasse discovered in an antique store which had previously been used in the student dinner hall of the Lycée Lakanal, in Sceaux, are le salon prive’s main feature. 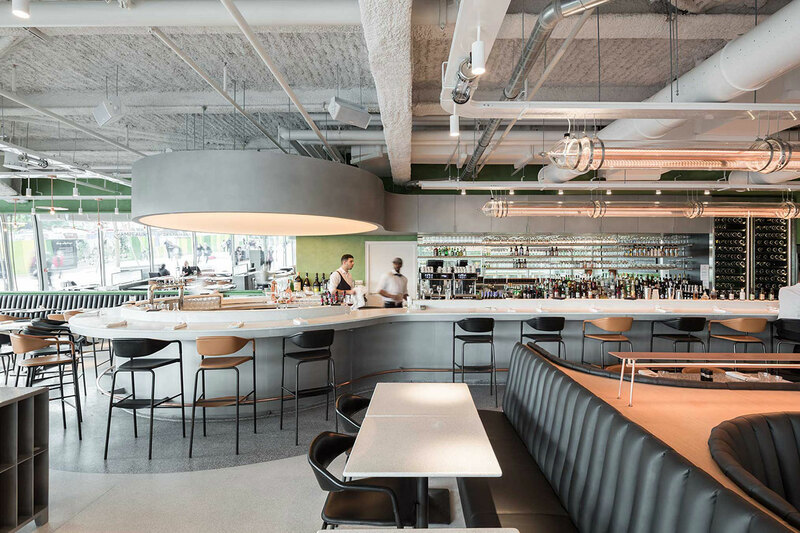 The imprinted "scars" of the tables past “lives” gives them character and imparts the space with a homey atmosphere that reflects the contemporary spirit with a traditional nod that accurately exemplifies the spirit of this totally French brasserie. 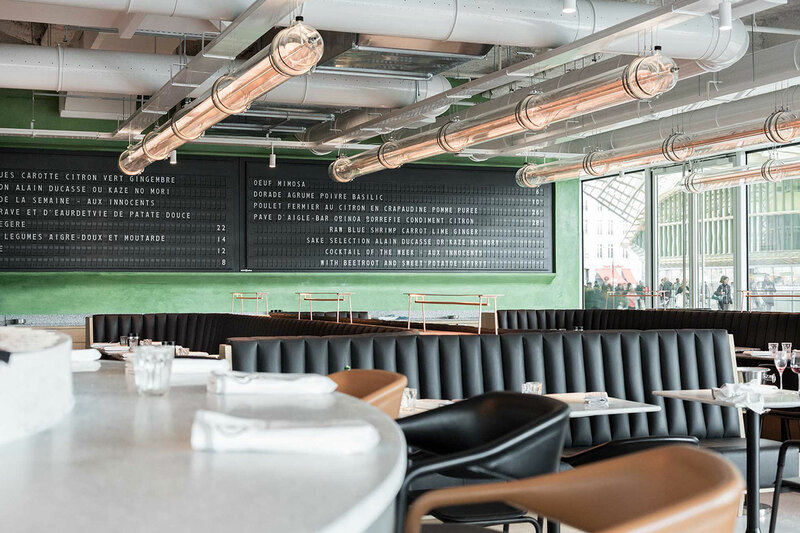 The far wall boasts an oversized display board reminiscent of the scrolls used in airports and railway stations, displaying menu information updated in real time.